I can't help it, this entire book is making me giggle. I hope they keep making these. Truth be told, my reading this book and my reviewing are somewhat far removed, but as I'm trying to get caught up on my reading/reviewing for the year, I'm going to talk about the impressions the book left me with, even after this amount of time. Ivan, a gorilla, has lived most of his life in a circus-themed shopping mall where he has been the star. There is also Stella, the elephant, and Bob, and stray dog who has befriended Ivan and Stella. When the owner of the mall decides that Ivan and Stella aren't pulling in the audience that they should, he purchases Ruby and tries to force her to perform for the shoppers, but she is young and scared and takes to Stella immediately. What stands Ivan apart from other gorillas is that he likes to draw, and the daughter of the custodian of the mall helps nurture this talent in him. As Stella grows older, Ivan promises to Ruby that he will watch over and find a way to get her out of the mall, even though he's really not sure how he's going to be able to keep that promise. What follows from there is a story full of love, hope, and humanity. 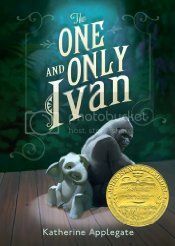 Ivan proves to be able to reach above his lot in life and keeps his promise for Ruby, but it's really how he goes about keeping that promise that is so amazing. This was a book that I'm glad that I read, and I know I'm not doing it any justice with this review, so just trust me when I say that this is a book full of magic and love, and if you have small children, this would be a perfect book to read aloud to them and to share and to talk about. So, I don't have any pictures from this weekend, which I'm a little sad about, but I volunteered to help my friend Sarah sell books at the Young Authors' Conference on Saturday this past weekend, and I got to hang out with Mary Robinette Kowal (author of Shades of Milk and Honey, Glamour in Glass, and Without a Summer), Jim Hines (author of the Jig the Goblin series, the Princess series, and the Ex Libris series), Courtney Moulton (author of the Angelfire series), and Aimée Carter (author of the Goddess Test series and the upcoming Blackcoat Rebellion series). Needless to say, I was pretty excited about the whole thing. Mary is hands down one of the most interesting people to talk to. I mean, the woman does everything. In addition to writing novels, she is a professional puppeteer (she does everything from sock puppets to shadow puppets to 125lb life size puppets), she is an audiobook narrator, she makes her own Regency dresses based off of authentic patterns, she teaches classes on both writing and narrating. Honestly, the list goes on and on and she's always a delight to talk to. Jim is an all around fun guy to talk to, and this is the first time that I've ever had a chance to really sit down and talk to him. We discussed ALA and discovered our shared love of Doctor Who, as we were both there in our Doctor Who t-shirts. Aimée and Courtney are always a blast. The two of them are best friends, so it's always fun to see how they play off of each others strengths at these events. I would say the event itself was a success for everyone. The kids seemed like they were really enjoying themselves, the authors thought the kids were really engaged in the seminars, and even the parents were enjoying themselves. I'm looking forward to volunteering again next year! So, this is an interesting 50th Anniversary story for the Doctor. Each of these stories can stand on their own, but there is also a background thread that is tying all these stories together as Eleven is contacting his previous regenerations and directing them to an end means that I'm sure will be revealed as more productions are released. I've never listened to any of the Big Finish productions before, and I'm thoroughly enjoying them. Having previous companions come in to do the voice work for the stories is really quite a treat for me. I like that these are original stories written for these productions as well, as I thought at first that these were just older productions being re-released for the 50th anniversary. When Eleven contacted One in the first production, and then contacted each subsequent Doctor, that's when I realized that these were all new productions with the running thread through them of Eleven directing his previous selves so that they didn't destroy the future. Or something like that. Clearly there is an overall story arc going on in the background that won't be revealed until I assuming Eleven's story is released. The first story, Hunters of Earth, is a decent story. It seems to take place before the events of An Unearthly Child, as Ian and Barbara don't seem to be involved in Susan's life yet. Susan is trying to fit in with the current school that she's attending, but there seems to be something wrong, as the other teenagers in the area are becoming increasingly violent and hunting down anyone who isn't normal, or who are "alien". Carole Ann Ford reprises her role of Susan Foreman, the Doctor's granddaughter, and does a great job. 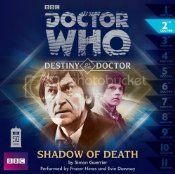 The second story, Shadow of Death, is IMO the best of the three that I have listened to so far. Frazer Hines reprises his role as Jamie and does a fantastic job of also reading for the Second Doctor. His rendition of Two is spot on. The Doctor, Jamie and Zoe, after an emergency landing on a remote planet sometime in the future, discover a human outpost there, where scientists are studying an uninhabited city. They need to be careful, as the star this planet orbits causes time to move differently than normal, so when inside the base camp, time moves "normally", while outside time moves much slower. The Doctor needs to begin to piece together what is happening to the inhabitants of the city before the scientists and the Doctor and his friends are killed. 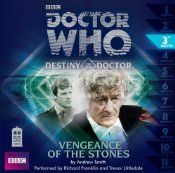 The third story, Vengeance of the Stones, was the hardest to follow. There are several characters in the story, and sometimes it's too difficult to follow who is speaking. Richard Franklin is back as Mike Yates, and he also does a decent job of acting for Three as well, but overall, I felt that there were just too many characters for only two voice actors to act out. The story wasn't exactly clear on what was happening either, something to do with the recumbent stone circles that are found around Scotland and how an alien race is going to use the power found in the circles to exact revenge against the Earth for a past grievance. Overall, not bad, just too much going on all at once. Eleven pops up in each of these stories via messages that he is sending to the past. 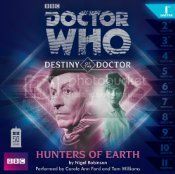 I'm going to continue downloading these as I'm really enjoying the audio productions and I'm intrigued to see what has Eleven so troubled that he needs to contact all his previous regenerations. Overall, I'm really pleased with these productions and will probably look for more from Big Finish in the future! Happy release day to Meg Waite Clayton for The Wednesday Daughters! You can find her new book at your favorite bookstore today, and I highly recommend picking it up. So, I'm not going to lie. When I received The Wednesday Daughters in the mail, I anxiously picked it right up and started reading, having loved Meg Waite Clayton's two previous novels. 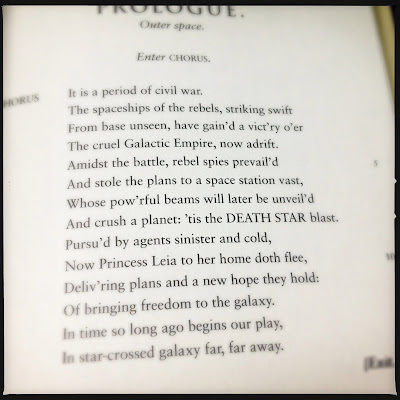 Then I thought for a moment that I was reading something a little too familiar. I felt like The Wednesday Daughters was treading too similar waters, that the characters from The Wednesday Sisters had been dropped into the setting of The Four Ms Bradwells, where friends go off to a cottage in the woods to deal with a major life change. Well, I was wrong. Yes, it does seem at first as if the Daughters borrow heavily from her previous two novels, but that's not really the case. At all. 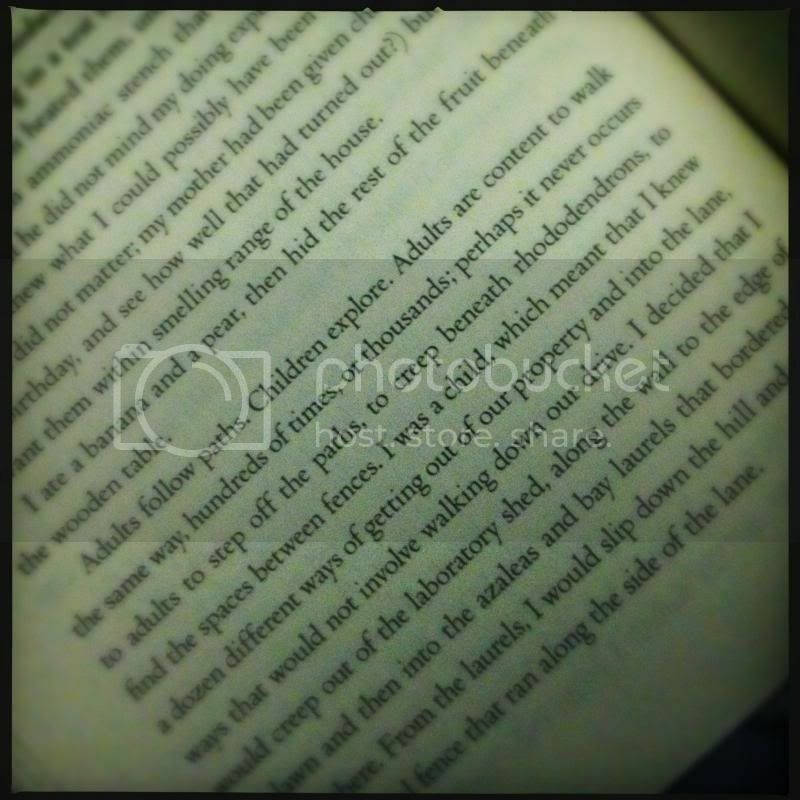 The book opens with three of the Wednesday Daughters, Julie, Anne Page, and Hope, arriving at Ally's (Hope's mother) writing cottage shortly after Ally's death. They've come here to help Hope sort through her mother's belongings, and almost immediately on their arrival, Hope begins to discover there is an entire portion of her mother's life that she didn't know about. What follows is a lovely story on the discovery of family ties and friendships, and how those ties can bind, even through the years and beyond death. Intermixed in the story is a biography of sorts of Beatrix Potter. Ally had been working on this biography when she died, and how Clayton has her go about working on it is actually quite clever. Quite frankly, once I really got into the story, I couldn't put it down. I actually read the entire book in two sittings, and I'm honestly embarrassed by my initial reaction to the book. Meg Waite Clayton has clearly had some amazing female friendships in her lifetime, as she knows how to write about them and create realistic and believable characters and the experiences and emotions, both good and bad, that flow between friends who are more family and who have known each other their entire lives. I liked how Daughters isn't a direct sequel to Sisters. Yes, there is mention of the Wednesday Sisters from the first book, and there are even guest appearances, but this isn't really their story. This story deals directly with the Wednesday Daughters, and the challenges that their generation can face in the real world. You don't need to read Sisters to enjoy Daughters, but being familiar with the first book does enhance the reading experience for Daughters. I love Meg Waite Clayton's writing. 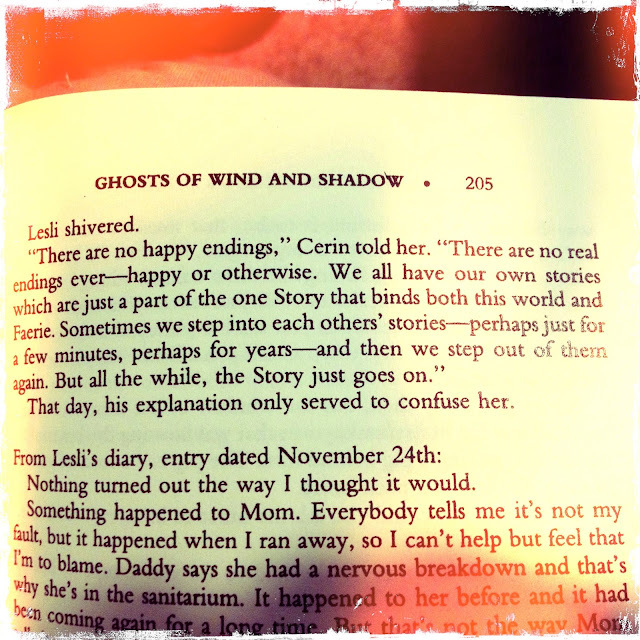 She writes in such a familiar fashion that is so easy to read, and moves the story along with such beautiful imagery. I enjoy her characters, I enjoy her pacing, I enjoy her language. So basically, ignore everything I said at the beginning of this review and pick up the book. If you've read her previous novels, you'll be reminded why Clayton is such a great writer, and if you are new to her writing, you'll be pleasantly surprised. Highly recommended and happy reading! 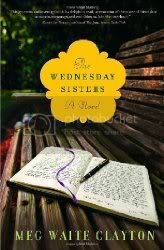 Tomorrow is the official release date for Meg Waite Clayton's latest release, The Wednesday Daughters, so I thought I'd re-post my review of The Wednesday Sisters. Daughters is a sequel of sorts to Sisters, as we now get a glimpse into the lives of some of the children of the Wednesday Sisters. Stop back tomorrow for my review of The Wednesday Daughters! 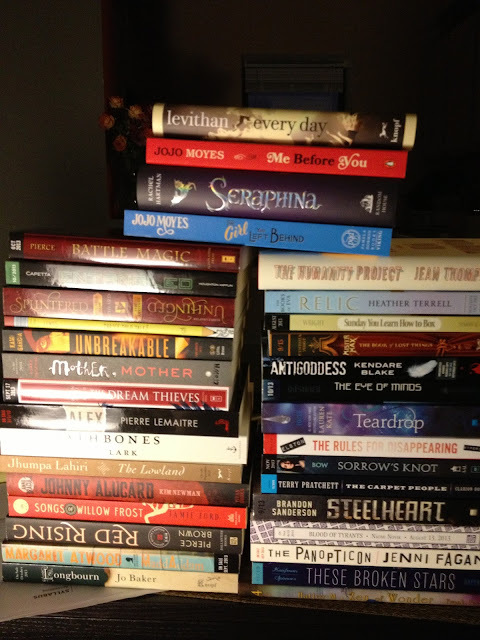 I received The Wednesday Sisters through the Early Reviewer Program at LibraryThing in 2008. It's an excellently written story about friendship and family (and especially how friends can grow into being more than just friends, they can become family too). From the moment I started reading, I knew that this was going to be a great book. The story revolves around no-nonsense, athletic Linda, super smart Brett, quiet Frankie, Southern Belle Kath, and shy Ally, friends who first meet every Wednesday in the park for play time with their kids, where they eventually start to discuss what books they've been reading and the general small talk of forming friendships. Later, they discover that each has had a small desire in one way or another to become writers, so the Wednesday meetings change to writing critiques, as they each try to help the other into becoming better writers. The book is so much more than just about their writing, though. It's also about the hopes, dreams and challenges of young families and budding friendships. We get a glimpse into 5 years of their friendship and watch through their eyes as the world is changing around them (the story starts in the summer of 1967) and how they themselves grow as individuals with the rest of the world. This was a delight to read; smartly written and nicely paced, with believable characters living real lives. I think Meg Waite Clayton describes her own book best, when the Wednesday Sisters are critiquing Brett's book and Frankie asks, "How did you make it so funny and so touching at the same time(?)... It's a little bit of magic, that." When I read that line, I thought the exact same thing about The Wednesday Sisters. 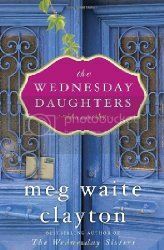 Meg Waite Clayton's latest novel, The Wednesday Daughters, will be released next Tuesday, so for the next couple of days I'll be re-posting my reviews of some of her earlier novels in anticipation of the release! In Meg Waite Clayton's latest, we are again introduced to a group of friends, but instead of watching their friendship grow like we did in The Wednesday Sisters, we find ourselves in the midst of a friendship already decades in the making. Mia, Laney, Betts, and Ginger have been friends since their days in law school, when they were all dubbed "the Ms. Bradwells" by their professor in their very first class at the University of Michigan Law School. We first meet the Four Ms. Bradwells during Senate hearings to appoint Betts to the Supreme Court, except a skeleton in their closet is uncovered from early on in their friendship that may hinder Betts' appointment. This skeleton also raises questions about their friendship and who has kept secrets from who over the years. Clayton also raises other issues in her book, including those of women's rights, but I'll leave the main issue that she brings to her story a secret, because it is this issue that ties everything together in the book, and I don't want to give it away. Needless to say, the secret has to do with a death, and this is the crux of the skeleton in the friends' closet that they need to overcome. The secret is brought up in the very first chapter so you're not kept waiting, and it's presented in a completely intriguing and compelling manner, making you want to find out what happened. 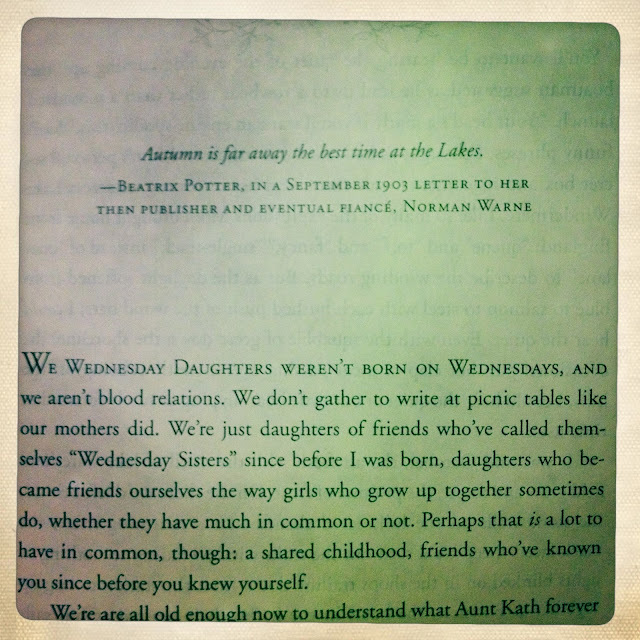 One of the aspects that I enjoyed most about The Wednesday Sisters that is carried over into The Four Ms. Bradwells is that I felt like I had gotten to know the friends by the end of the book, that they were my friends too. Clayton has a knack for making her characters completely believable and tangible, with all the quirks and imperfections that would make them real people. They have real faults, real problems, aren't perfect, and in this imperfection, she has created honest and true characters. 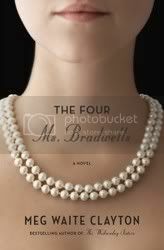 Do yourself a favor and pick up The Four Ms. Bradwells. It's a refreshing read for early summer and while it does deal with some heavy subjects, it does so in a manner that is easy to read and relatable to the characters. And while you're at it, if you haven't read The Wednesday Sisters, pick that up at the same time. Both books are excellent stories on the power of friendship and what that power can help friends overcome. 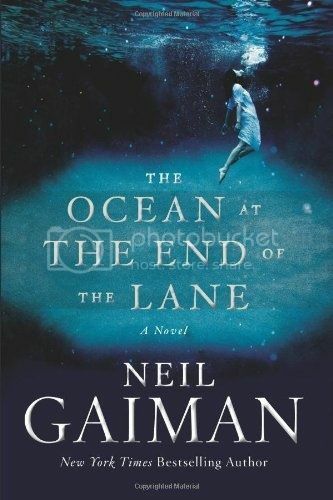 I'm not entirely sure that I would be able to do justice in describing Neil Gaiman's The Ocean at the End of the Lane. The book is equal parts nostalgia, beauty, terror, and magic. Nostalgia for a simpler time when magic was all entirely too possible for a young child; the book is beautifully written, nothing forced, it just is; Gaiman's writing is capable of creating such terrifying imagery to what can scare a child, something that would not be possible in less deft hands; Gaiman has created a magic all his own for adults, by reminding us that once upon a time, our childhood selves did believe in magic, and somehow he reawakens that sense of wonder in this small volume he has crafted. It's a wonder that such a slim little book is capable of manifesting so many emotions in such a short time. This is Neil Gaiman we're speaking of, so of course it really comes as no surprise to me when I really think about it. I think I may just leave this review, for what it's worth, at that. I mean, I could go on and on about the book, but I don't want to give anything away. The magic of the book is in letting it speak for itself, telling you its story, and letting you take it all in. So, if I haven't made it obvious, this is a book worth reading. I know it will be topping my list of books for the year, and I know it's going to be one that I will be revisiting over and over again through the years. 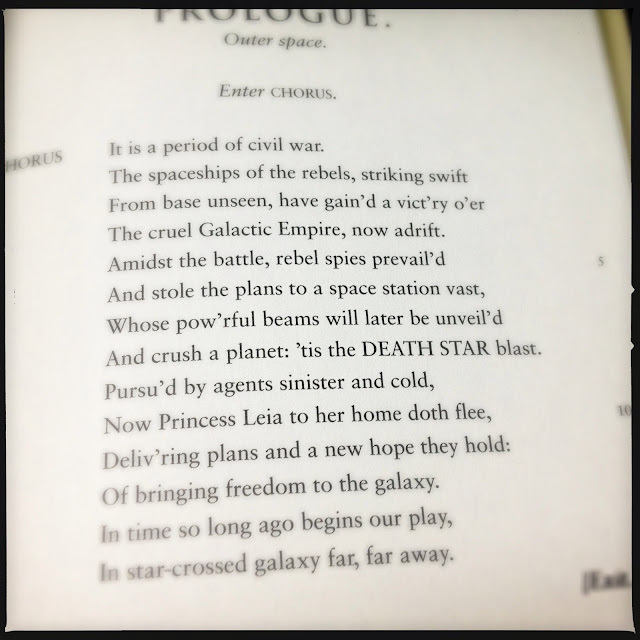 This book and I are going to become best friends. Go and read it. Read it again. You won't be sorry. 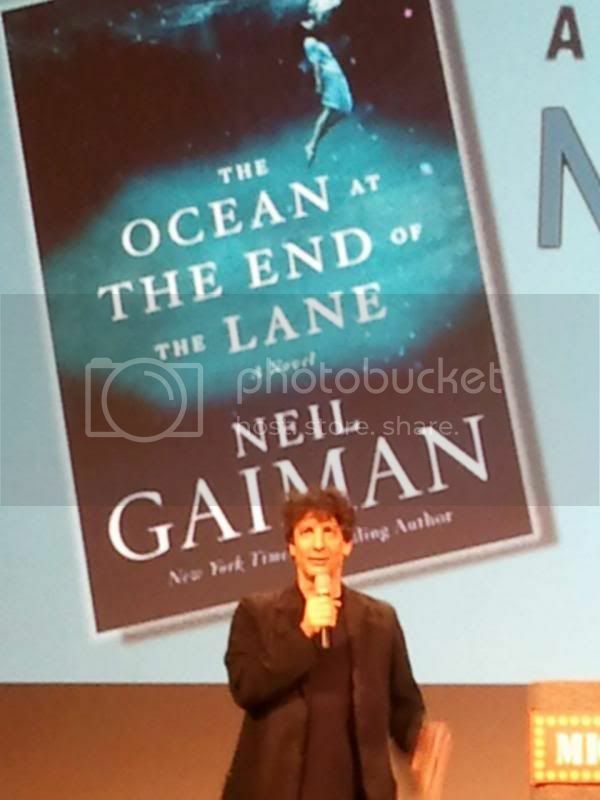 Also, check out my post on the night I met Neil Gaiman for his signing of The Ocean at the End of the Lane. The man is a rock star in the writing world. Don't really know much about this, but I'm giving Bloglovin' a chance to see if it can get me a couple more followers. So, if you've got nothing better to do right now, follow my blog with Bloglovin! My friend Ann took this picture during his Q&A. That right there is Neil Gaiman. I got to meet him last night. I got to shake his hand last night. I'm a little excited about that fact, not going to lie. 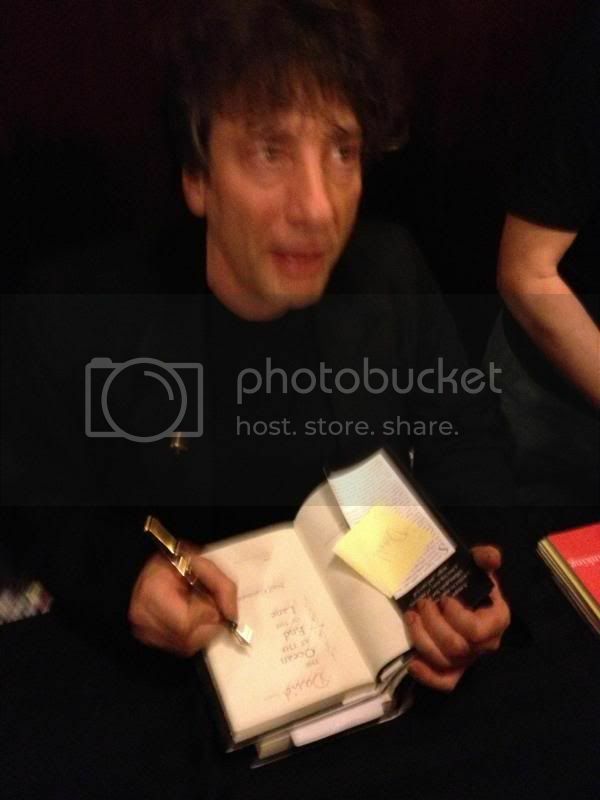 Nicola's Books hosted Neil Gaiman in Ann Arbor last night at the Michigan Theater in Ann Arbor (his only stop in Michigan!) on his final US tour for his new book, The Ocean at the End of the Lane (which is a beautiful, terrifying book - I'll have a proper review posted up this week). He ended up arriving almost an hour and a half late due to circumstances wildly out of his control (the unfortunate airline crash in San Francisco on Saturday). However, he was at the theater within 45 minutes of touching down at DTW and was apologetic, humble and sincerely grateful that we all waited patiently for him. Before he came out on stage, he scarfed down some sushi and then signed 200 books for people that couldn't stay for the signing after the reading. He read a little from The Ocean at the End of the Lane, answered some audience questions that had been written on note cards prior to his arrival, told some funny stories about his travels getting to us, and then read some from Fortunately, the Milk, his kid's book coming out in September. 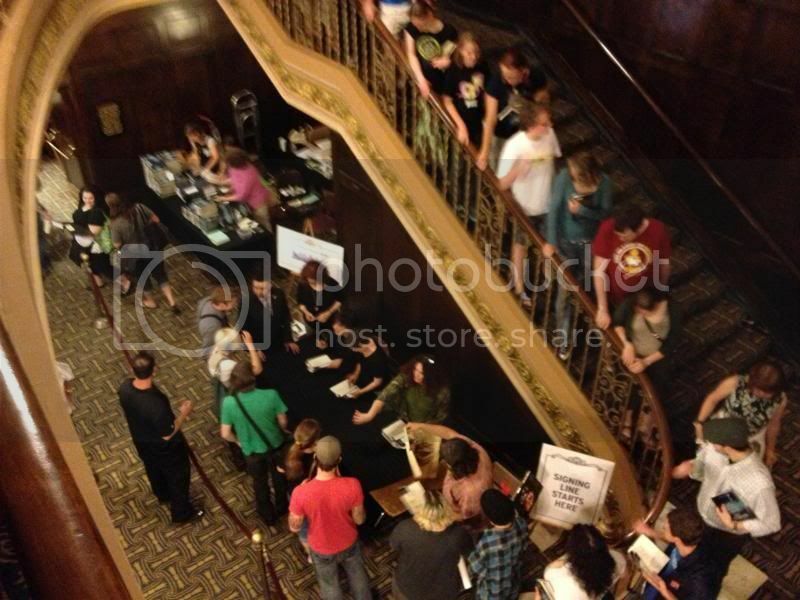 He then ran off to the signing table and signed I don't know how many books for all 1700+ people in the theater, never complaining, always smiling and having a kind word for each person, even though the team from Nicola's had that line running like a well-oiled assembly line machine. In line, waiting for the signing. The man was fantastic. 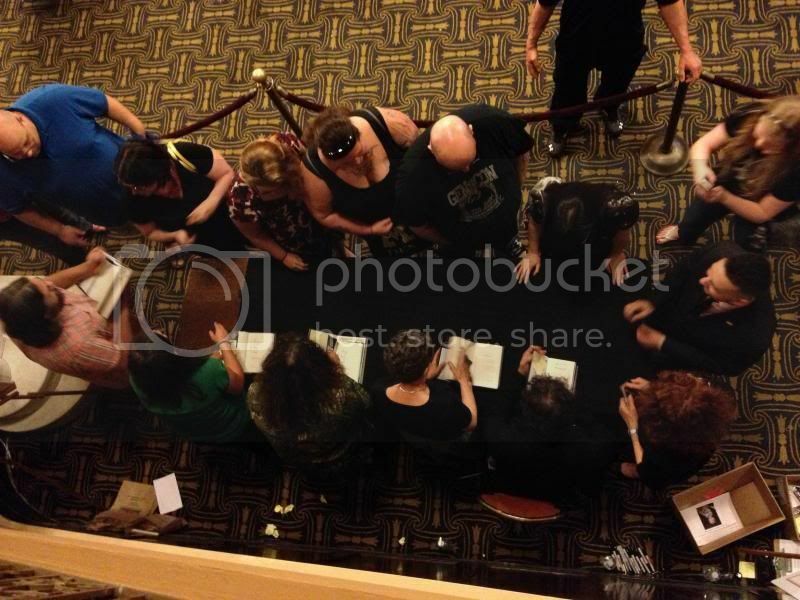 He was never grumpy about all the people there waiting to get books signed. He made the theater change the signing rules back to what they were supposed to be. Originally, we could get as many copies of Ocean signed as we wanted, and then one additional item. Because of his delay, the theater changed it to one item total. Neil let them know on the way from the airport that he wanted it back to the original rules, since it wasn't our fault that he was late. So yeah, Neil Gaiman is a superstar in my book. 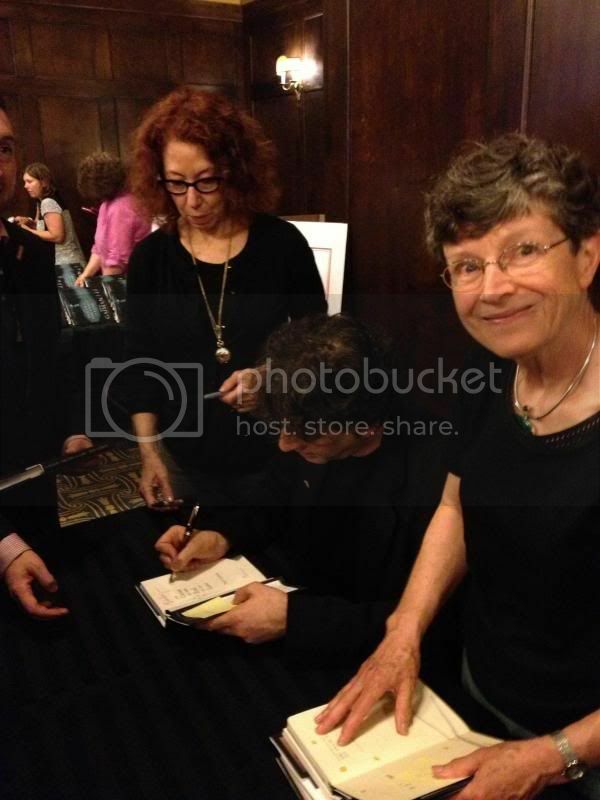 After he signed my books, he took the time to shake my hand and thanked me for being patient. I'm a little sad that he won't be touring anymore in the US, but I can understand why he can't do it anymore. 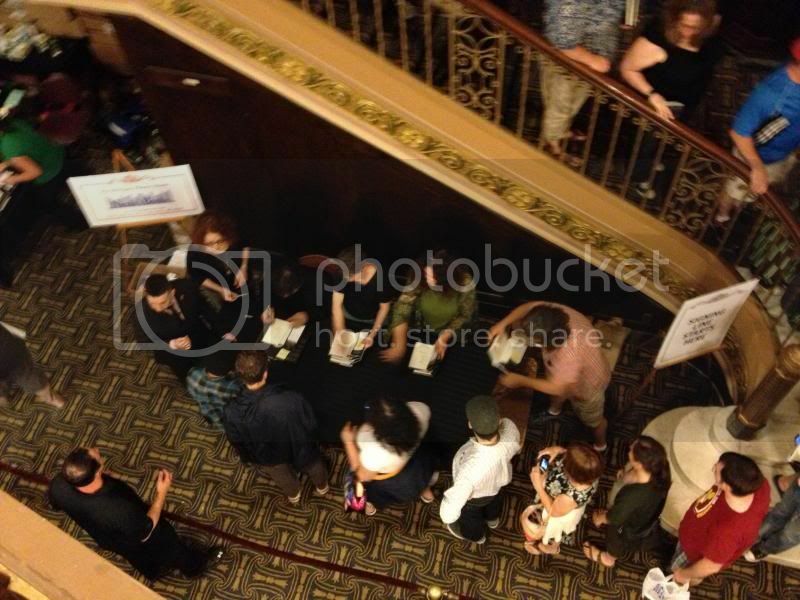 The number of people there last night was amazing, and I can't imagine how late he was there, as we left somewhere around 11pm, and there was still probably half of the theater left to still go through the signing line. Needless to say, the evening was a rousing success and props to Neil Gaiman, Nicola's and the Michigan Theater for helping to make such a fantastic night. 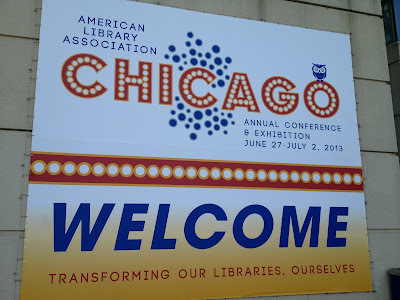 So, this past weekend I went to Chicago to attend my first ever ALA Expo, and it was a fantastic time. 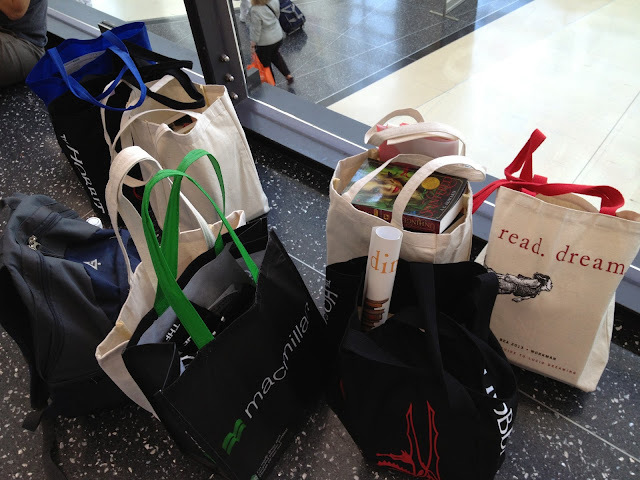 I got to hang out with two of my book besties, Gail from Ticket to Anywhere and Jen from Hypable. The event itself was both exhilarating and exhausting all at the same time. We went to the opening night of the exhibit hall on Friday night, and there were just swarms of people there. I missed out on the Saturday morning opening as I was running a 10K that morning, but made for the afternoon, and was there for maybe about 1 1/2 hours, and the crowds weren't quite so bad, but it was still packed. Gail and Jen had already left for the day, so I just wandered around, taking it all in, picking up a few books as I went along. This was the night that I ran into the most authors that I was excited about meeting, such as Paolo Bacigalupi, Audrey Niffenegger, and Amanda Sun. Sunday I made it down for the opening of the exhibits, and the three of us wandered the exhibits until about 3pm and decided to call it a day for ALA.
We never really made it out of the Big 6 area, but I was ok with that. The hall was ginormous, and it was hard to take it all in. I did wander back to the graphic novel area on my own Sunday, and happened to run into Frank Beddor, whose Looking Glass War series I just love. We chatted for a minute, and then he gave me a signed copy of the special edition of the fourth Hatter M graphic novel. I really didn't know what to say to him. Honestly, with the exception of one author who took it upon himself to make me know who he was, every author at ALA proved yet again that author's are rock stars in my book; they are a generous, appreciative group of people who are always willing to chat with their readers, and I feel really lucky to be doing what I'm doing and getting to meet them. 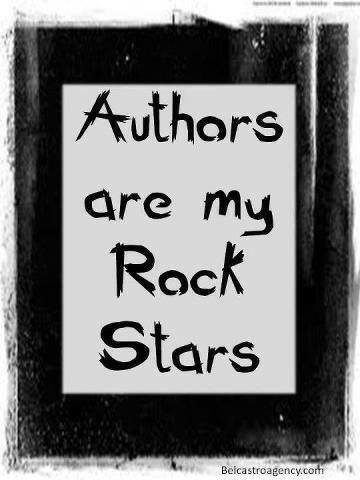 The author community, on the whole, is a remarkable group of people. And that was just one of the days! 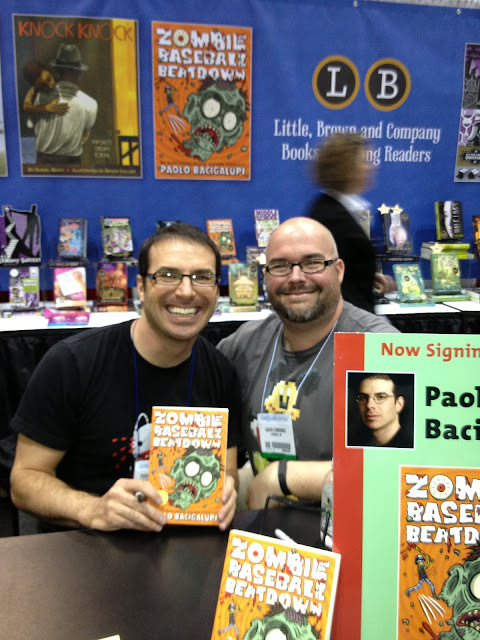 That's me with Paolo Bacigalupi! I got to meet several authors, including Paolo Bacigalupi, Audrey Niffenegger, Amanda Sun, Jojo Moyes, Rachel Hartman, David Levithan, and Frank Beddor, to name a few. 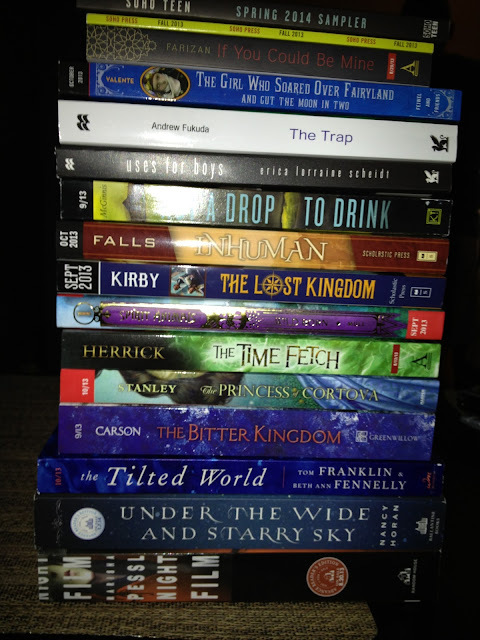 I ended up with 61 books total, 50 for me and 11 for friends. Not too bad, is it? 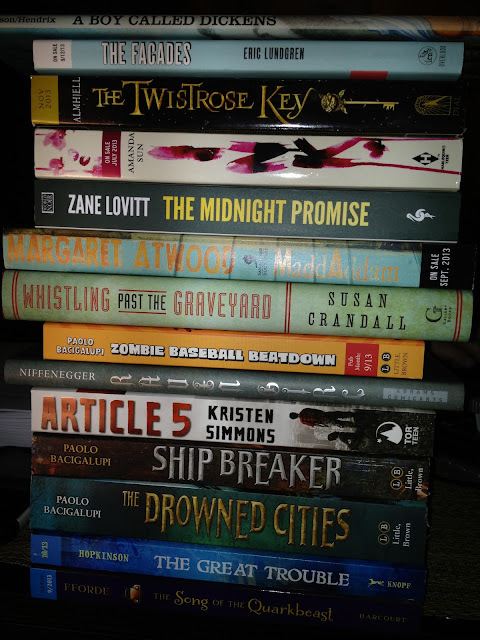 Now, to only find the time to read all these loverly books! So, not going to lie, this was a whirlwind busy weekend, but I would absolutely do it again and am already looking forward to next year. The ALA people really know how to put on a good show!